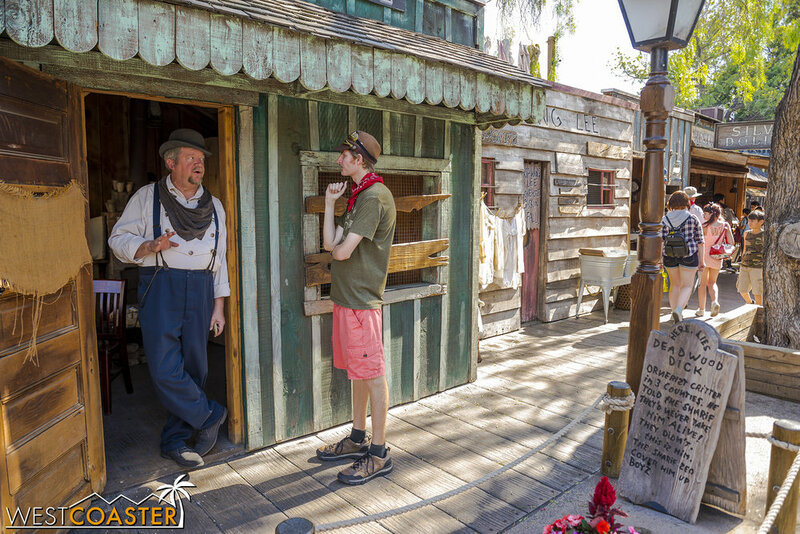 It's summer, folks, and around Knott's Berry Farm, that means the return of the enormously popular Ghost Town Alive! immersive and interactive theater event. 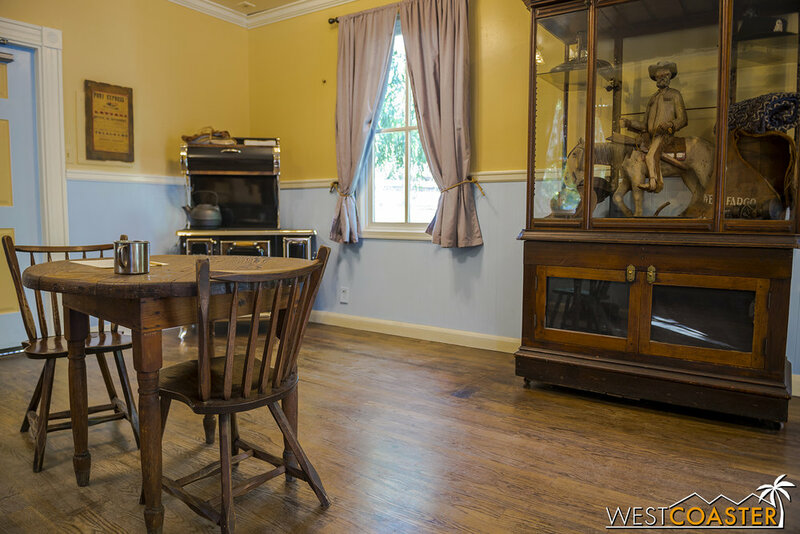 This overlay debuted last year to wonderful fanfare, bringing a new and richer layer of thematic atmosphere to the most classic part of the Farm, and it quickly developed quite a following of regular guests and fans. The climactic and cliffhanger ending of 2016's Ghost Town Alive! storyline left fans eager for more and excitedly anticipating the event's 2017 return. The finale was literally explosive, seeing the return of one Ox Mayfield, patriarch of the rascally Mayfield clan, stealing a steam engine into town to free and rescue his family before chugging off into the sunset while swearing revenge on all of Calico. How would the plot continue this year? Before we plunge into this year's proceedings, lets step back and look at the principal cast of characters for Knott's summer season event. For those unaware or too lazy to read through either linked update from last year, Ghost Town Alive! 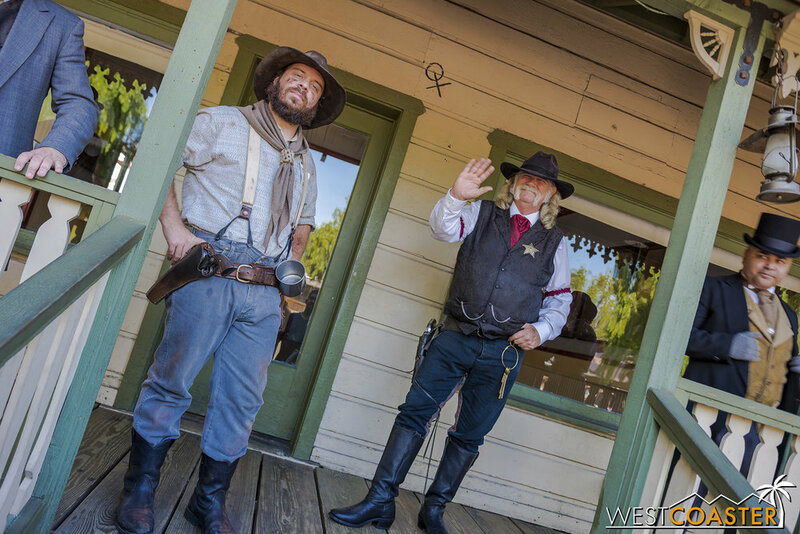 is basically an interactive role playing live theater show set within Knott's Berry Farm's Ghost Town area. 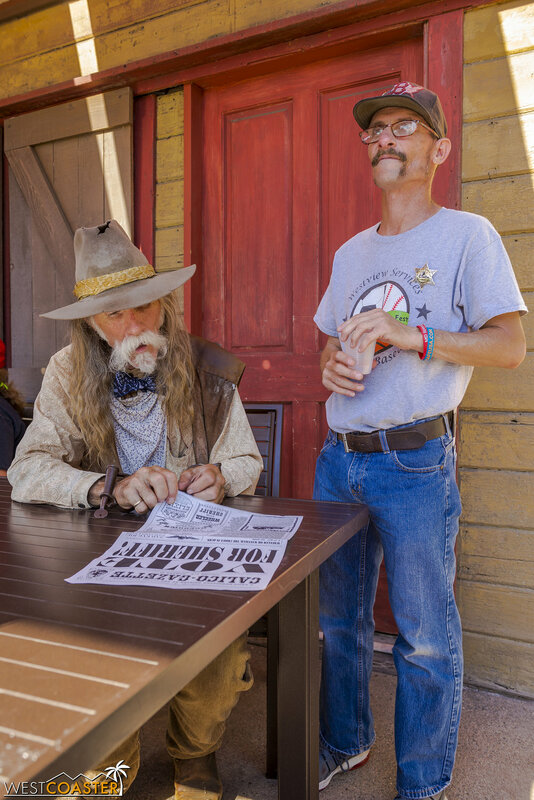 Over the course of the day from park opening until about 6pm in the fictitious town of Calico, a series of events transpire that impact the town's characters. These characters are associated with many of the various buildings in Ghost Town and even some of the legendary peak-in's, which are open for visitors to experience. 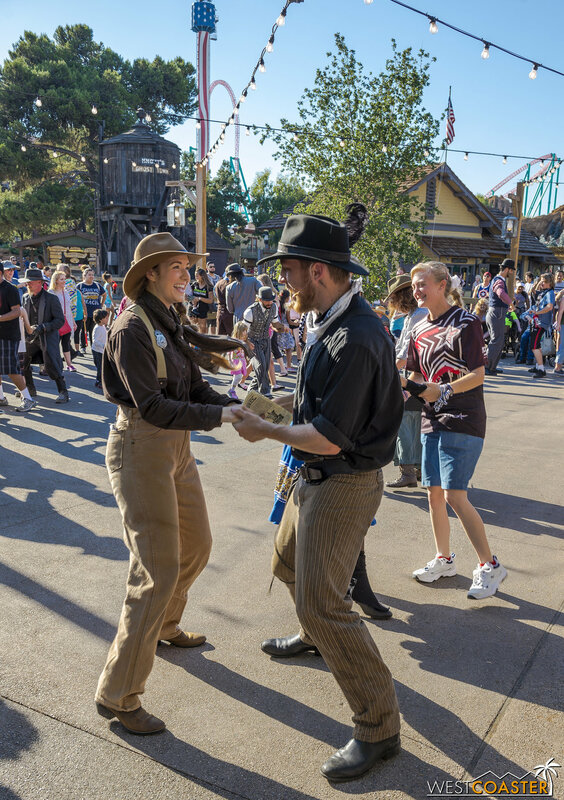 Park guests are also citizens of Calico and can engage with various characters by taking part in the role play, performing tasks and favors, and bringing an improvisational element to the story. 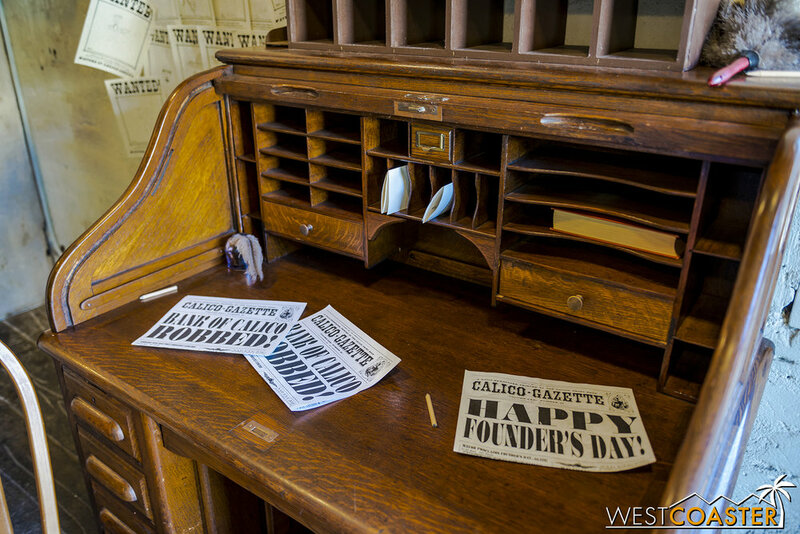 Guests can form alliances with the protagonists or the villains, and everything culminates in the big Founders Day hoedown in Calico Park at 5:30, when the plot comes to a head. Last year's Ghost Town Alive! featured a sprawling cast to cover the various parts of Ghost Town, and those characters are by and large returned in this year's story. They're also joined by a few new characters. Lets meet (or re-acquaint) the actors of 2017's Ghost Town Alive! Town Hall is once again a focal point in Ghost Town Alive. The room has been switched over from its Boysenberry Festival and has portraits of Calico's [fictitious] historical figures, including the matriarch of the Mayfield clan in the middle there. Wanted posters for the Mayfield clan. I didn't see Pitt or "One Shot" during my visit. And Ox remains at large. The little touches are cute. Mayor Horton Parnell poses outside his hall. On this day, his wife, Pearl Parnell, was off "traveling." Deputy Mayor Milton C. Howell took Pearl's place as the chair of the fair elections committee. Town clerk, Kenny Storm, "hard at work." The master of the reading is also a strong proponent of Mother Murphy's Boysenberry Elixir. Last this year, this was Miss Sierra, a schoolteacher at the Schoolhouse. This year, she is just "Sierra Mist," the town poet. Meanwhile, Maggie Mills is the head schoolteacher in the Schoolhouse itself. A charming wedding in front of the Schoolhouse between Maggie and town Dr. Dillard Marsh. Newspaper editor Bixby Knolls holds up the latest edition of the Calico Gazette, which makes multiple printings a day and even includes the names of some interacting guests. Looking Glass Thurmond stops by the Gazette to catch up on the news. On the afternoon I stopped by, the Mayfields had been captured. Here's poor ol' Ike. And one of the newly introduced Mayfield family members, Fluke Mayfield. Ike, Fluke, and Scruff Mayfield holed up in a cell. Inside, Clay Mayfield has also been captured and is under personal supervision by Sheriff Bryce Wheeler. Clay seems resigned to his fate, acknowledging that this would not be his day. But he does have time to stop and look dramatically through the windows. The Sheriff's Office--normally a peek-in--is once again open to guests. Deputies Sutton Wyn and Luke Stillwater stand guard outside the office when Wheeler is away. The one Mayfield who hasn't been captured? Tiny Mayfield. But more on why in the next section. Doc Carter minds the barbershop while normal barber Percy Boyer is away. Guests can still get a free [drawn-on] mustache here. Postmaster Quint Campbell minds the Assay's Office too, while Agustus French is away. Calico Bank owner Tate Fortune poses with Calico Citizen and Pony Race organizer, Nellie Simmons (who also works at the new Pony Express office). This year, there are "pony races" several times a day that kids can take part in. 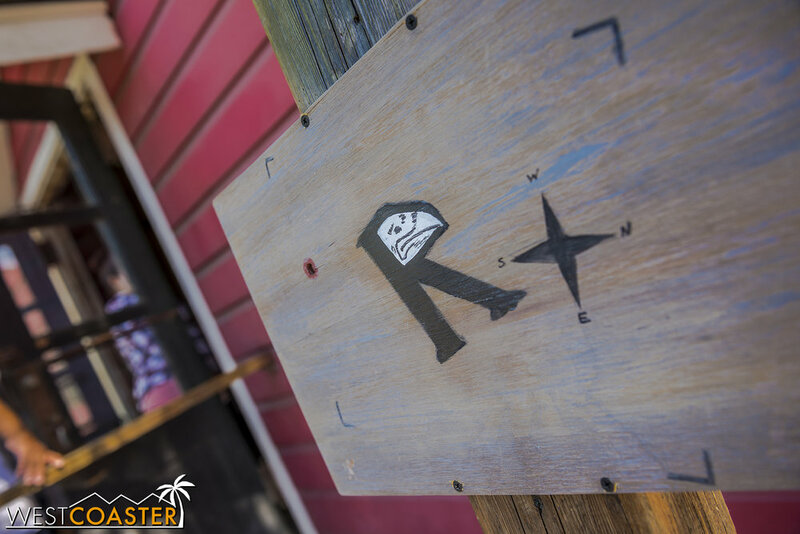 Brett Eastly also minds the new Pony Express office. Bixby Knolls and Dilard Marsh conversate about the day's adventuresome events. At Calico Park, Clay Mayfield poses with his son, Tiny. Gertie has hired a new assistant, Frances Parsons, for her dress shop, and she minds the entrance and chats with passers-by. She's friends with the Calico Saloon cast. The famous Saloon can-can girls, Dixie and Trixie, are quite popular. This year features a new storyline that shares a lot of similarities in the structure and cadence of last year's typical Ghost Town Alive! day but carries a different angle. There are certainly subtleties that reference events that occurred last year, plus the addition of new elements designed to further engagement and activity. If you do not want to be spoiled, then do not read the captions in the photos below. And if you REALLY do not want to be spoiled, then just scroll through all the way to the next block of larger text. Ghost Town Alive! starts at the 10am park opening, with the day beginning in normal fashion. Citizens go about their business, greet guests. It's all quite typical. But then, there's a robbery at the Miner's Bank. The Mayfields, who have just been let out of jail that day, escape the bank with just one item--a deed. They are pursued by Sheriff Wheeler, who catches all of them except for Tiny. And then, as it turns out, the deed reveals that the Mayfield clan is actually the rightful owners of the town of Calico! Unlike last year, this is not a forge deed; it is very real. With most of the Mayfields convicted, the deed is passed onto the next free heir--Tiny Mayfield himself. Now, it just so happens that this is also the day of the Calico election for Town Sheriff. Incumbent Sheriff Wheeler is unopposed, but in an attempt to free his family, Tiny decides to run against Wheeler in hopes of gaining the authority to pardon his brethren from their imprisonment! That's a mouthful, but that was everything that happened in the day up until I arrived mid afternoon this past Saturday for my visit. If the story sounds familiar, it's because it parallels last year's adventure, with adjusted details. But overlaid this year is a second mystery--clues scattered around Calico that promise sensitive and private information about the Mayfields. They're being marked by a mysterious samaritan named The Raven. No one knows who he is, but guests can follow the clues imparted by his markings to try to decipher the puzzle. Hint: it might be helpful to use the map on the back of a copy of the Calico Gazette to align with the board and not where certain holes or markings lie. The Raven's clues are everywhere, even at the Gazette office itself! At 4:15, the election begins, lasting for about 20-25 minutes. It's open to all citizens (and guests). 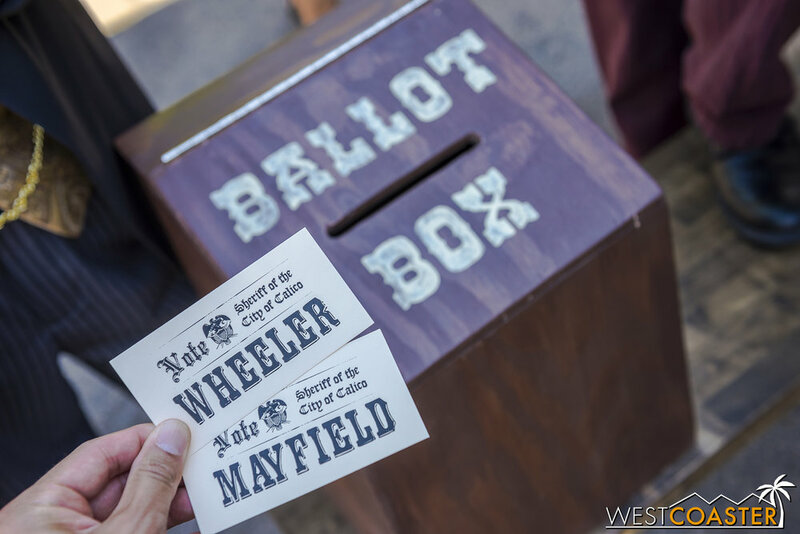 Vote for Wheeler or Mayfield. The votes all actually count. 4:30 sees the wedding of Dr. Dillard Marsh and Ms. Mills. At 4:45, the townspeople gather in front of Calico City Hall to hear the results of the election. Deputy Mayor Howell thanks the citizens for their civic participation, as Tiny and Sheriff Wheeler await the results. "LADIES AND GENTLEMEN... ARE YOU REAAAADY FOR A READINNNNNNG????" On this day, the incumbent retains his seat somewhat handily. Bryce Wheeler makes a victory speech as Tiny Mayfield glowers in the back. Tiny cannot help but make his displeasure known and even accuses Sheriff Wheeler of being responsible for throwing Mudd Mayfield to his death last year while pursuing Ox Mayfield and the stolen steam engine--a claim that the Sheriff rejects and attributes to an unfortunate accident. Clerk Storm swears Sheriff Wheeler in for another term. Over near the Pony Express roller coaster, a Pony Express office has opened. Inside, there are plenty of packages awaiting delivery to and from the town. Guests can help various characters with these package sendoffs. It's a drastically different look from last year's scientific setting. As the hoedown approaches, Brett solves his problem of having no one with which to attend by asking out Nellie to be his date. The Founder's Day celebration brings Citizens of Calico and guests together in dancing affair. Mayor Parnell thanks everyone for coming. Despite their prisoner status, Scruff Mayfield is allowed to call the dances. The crowd engages in several line and country dances, taught to them by the Citizens. It makes for great revelry! Mayor Parnell goes to make another speech, but he is interrupted by Tiny Mayfield, still sulking after his election loss. The Mayfield heir proclaims that this will be the last Calico Founder's Day ever, because as the legal owner of the town, next year will mark the first ever [renamed] town of Mayfield's Founder's Day! Sheriff Wheeler, who had been conspicuously missing during the festivities, interrupts Tiny's tirade with some shocking news. It seems that he followed The Raven's clues and found a box that contained Tiny's diary. And there, in the Mayfield's own handwriting, was a checklist and confession that Tiny set up the bank robbery to frame his family members and arrange for their capture, leaving the Calico deed to himself! Tiny is captured and jailed for conspiracy for robbery. Meanwhile, the mysterious Raven is revealed to be... Fluke Mayfield??? It turns out that Fluke never really fit in with the rest of the Mayfields' outlaw lifestyle but always wanted to be a part of the family. Thus his participation. But wanting to have a clear conscious, he planted clues under his alter ego to lead the lawmen to the truth. For his efforts, Fluke becomes the next non-imprisoned Mayfield, which means he become the new owner of the Calico deed! Whether this was by pre-planned brilliance or was just, well, a fluke, the result nets Fluke Mayfield success and even a new lady interest. With the bad Mayfields put away, everyone finishes off the Hoedown with more dancing. And then, in a line, everyone caps off the day with a cheer through Calico! As I mentioned last year, the most appealing part of Ghost Town Alive! is its impact on guests. 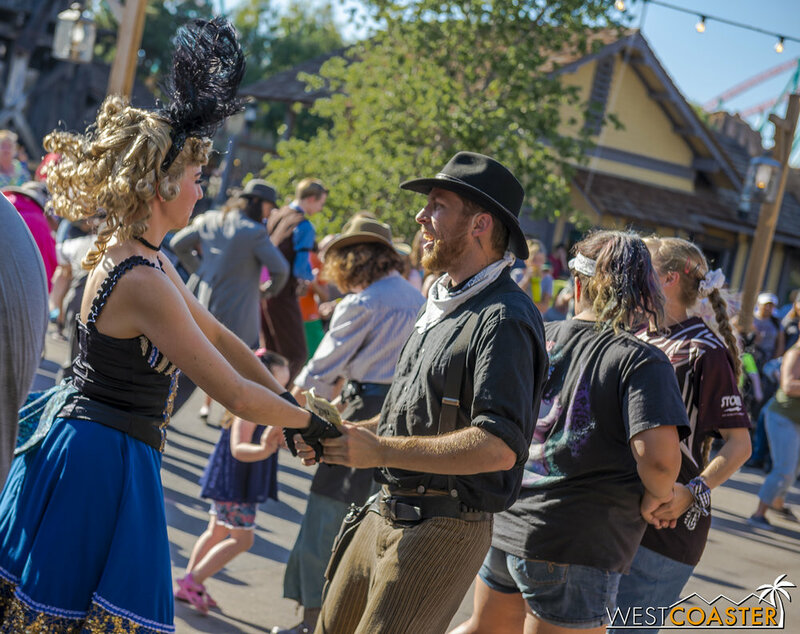 Ghost Town has become transformed into a sprawling stage, and not only are the Citizens of Ghost Town the characters, so are everyday park guests. 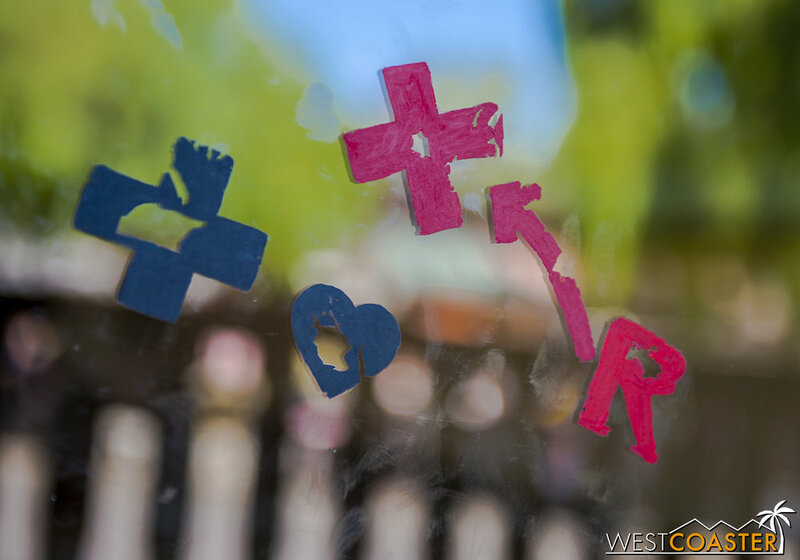 Anyone can join in on the fun and be a part of the overarching tale, and many do. That innocent, family-friendly spirit of make-believe that we all took part in as children is very much alive here. And you can tell from the way the Citizens and guests interact with each other that they are both enriching each other's day. The joy and excitement that guests carry as they go about various activities supporting the story is positively splendid, and it makes for magical memories and experiences. A young guest signs the Calico visitor's guest book with Mayor Parnell's guidance. Over at the bank, two young honorary Calico citizens open up an account. Another young citizen interacts with Bixby Knolls, who bestows certain journalistic duties to eager guests. There is genuine interest and excitement through the character-guest interactions. 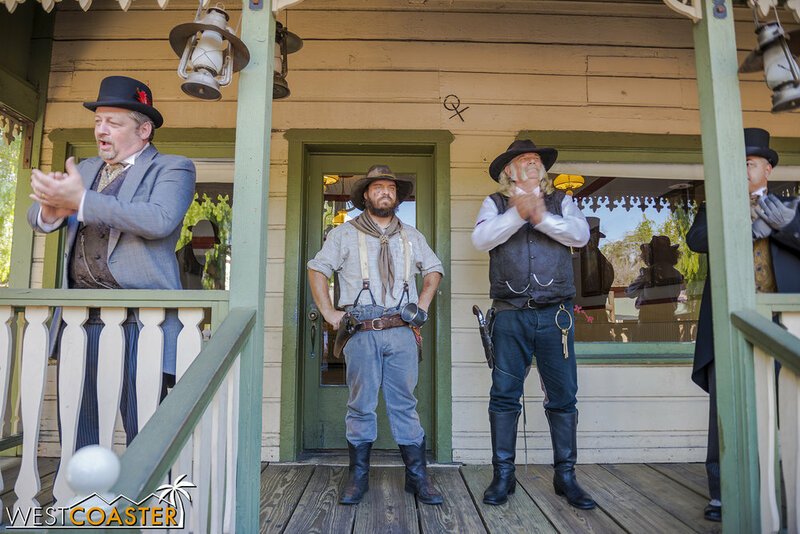 From one-time visitors who fall into the spell of the interactive play to season passholder repeat visitors who weave their own roles and are recognized by the cast, plenty of people slide into the escapist fun that Ghost Town Alive! brings. The interaction isn't always Citizen of Calico with human. Sometimes, you have to read a paper to a horse, of course, of course. It's really great to see this display of live theater bring people out of their shells and really throw themselves into engagement with the cast. It's a spirited series of improv, set in authentic history. It's also clear that certain characters have their own fans. 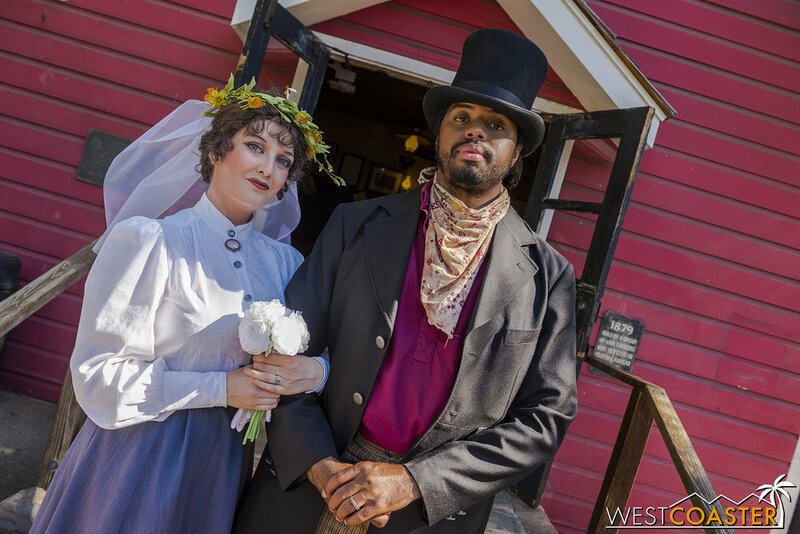 The celebrity never seems distracting, and the connections forged through Ghost Town Alive! really resonate. Many people agreed from last year's event and update--Ghost Town Alive! is one of, if not the best thing Knott's has put out in a very long time. ...and it also allows children to indulge in their imagination and truly live out their own fantastical adventures. 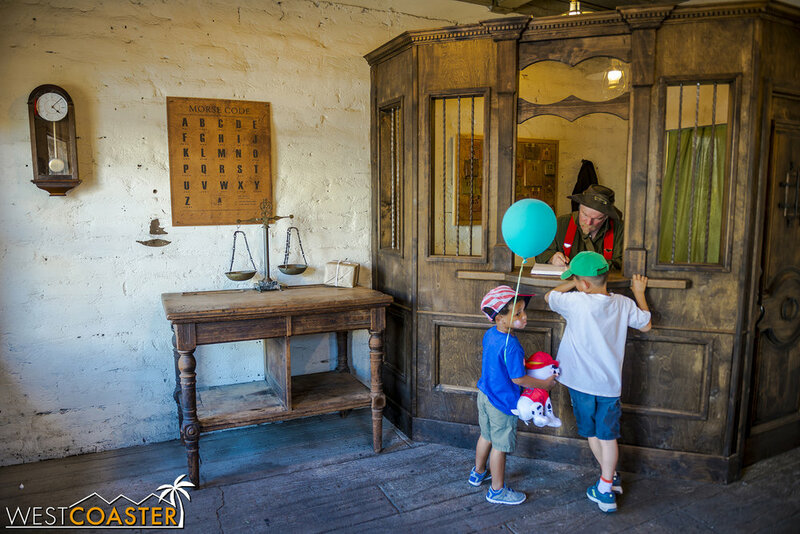 The family-friendly scene brings plenty of glee, and I have no doubt that Ghost Town Alive! has created a slew of cherished memories for countless people. At the end of the day, that people connection is undoubtedly the most precious aspect of this summer event. Without a doubt, Ghost Town Alive! continues to be a wonderfully successful and immensely charming event. The way the characters engage the guests is heart warming to observe, and the excitement and enthusiasm of both the actors and the guests playing and forming their own roles is infectious. 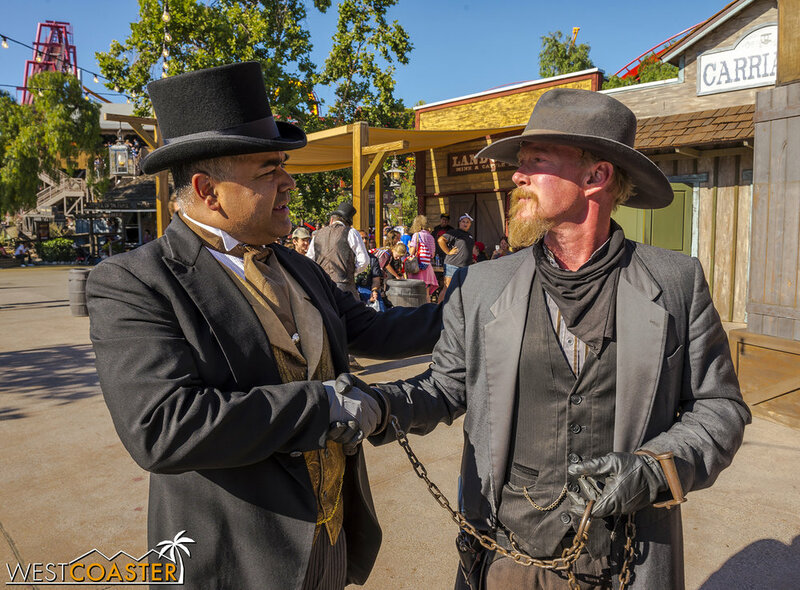 Knott's has a new tradition on their hands, and this type of interactive forum brings great energy to the Farm. Ghost Town Alive! runs now through Monday, September 4th (Labor Day). If you're a season passholder or just a local who has always enjoyed the ambiance and old-fashioned beauty of the park, you will regret missing this event. It's truly a gem, and I applaud Knott's Berry Farm for continuing the overlay this year. WHAT?? THE CATAWAMPUS HAS GONE MISSING?? NOOOOOOOOOOOOOO!!! THIS IS A TRAGEDY! AND/OR A TRAVESTY!!! Did the Catawampus escape, showing the ability to move for the first time in observed history, or was it Catanapped? In any case, we must not rest until we solve the mystery of our beloved vanished Catawampus!! To arms, Westcoasterers! To arms!!! Corrections: Earlier drafts contained a couple of misidentified characters, which have been corrected. I've also gone back and added names to other characters who had been anonymous. Thanks to Knott's marketing and entertainment departments for helping fill in the missing information!